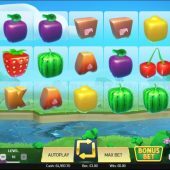 Strolling Staxx slot, or 'Strolling Staxx Cubic Fruits' to give use it's full and rather laborious name, is a Netent low-tech game along the lines of Twin Spin and Starburst. We have transparent reels over a river flowing through an unnatural landscape where everything is square and there are few curves. Yeah, we get the name Netent. The theme is about equally squared fruits and we spin to some anonymous music accompanied by splashing sounds as the reels appear to spin down through the river underneath. Let's hope our bankroll doesn't take a dive into it too. 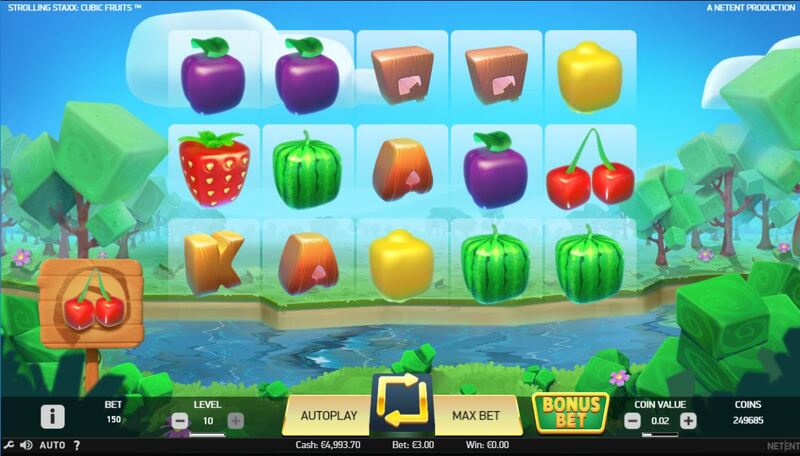 We have 10 paying lines on Strolling Staxx slot and symbols are single although randomly that could change. For now you can get 500 coins for 5-of-a-kind Wilds or Melons, 150 fro Strawberries, 120 for Lemons and 100 for Plums or Cherries. There remainder are four boxy-looking card values of either 50 or 30 coins. The reason I mention coins and not times-bet is because you can choose to either bet 10, or 15 coins if you want an enhanced feature. There are no scatters, so how do we actually earn this feature? Right, on each spin there will be either or both of one stacked symbol and Colossal 2x2 or 3x3 symbols added to the reels as they spin. The symbol in play is indicated on a little signpost to the left of the grid. You need to land a full 3-row stack on any reel to trigger respins. The full stack or stacks will immediately move one reel to the left and the respin can add symbols to create wins. Now if you bet the extra 5 coins and play 15, the initial respin has colossal symbols of the same type as the triggering one added to the reels to give a better chance of bigger blocks. You respin until all full reels have left the grid, then are paid for the total collected. For example you could trigger with a reel of Kings on 5, this will then move to reel 4 and then a colossal 3x3 could land on the first 3 reels and more Kings on reel 5. The wins are counted, the whole lot moves left one reel with winning symbols sticky. This means you can win on several consecutive respins before the win disappear off the grid to the left.